A Shakespearean production with American movie stars? An endemically American play performed by British actors? And both events running locally in parallel universes through July 1? What is Los Angeles coming to? Mostly good things. 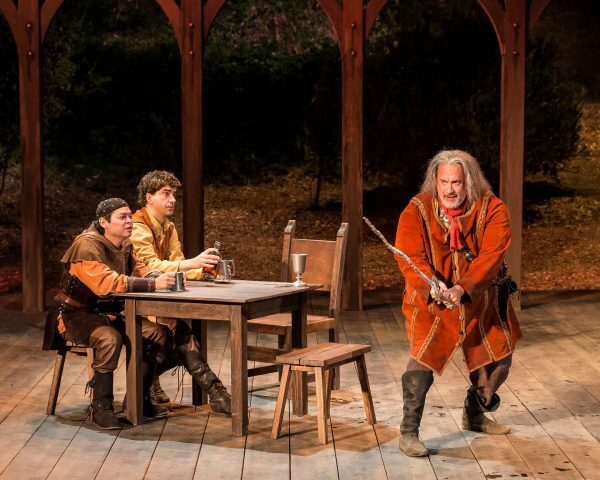 When it was announced that Tom Hanks (yes the Tom Hanks) would be playing Falstaff on stage in The Shakespeare Center LA (SCLA) production of Henry IV, it raised a few eyebrows. But not very high or for very long. After all, given his phenomenal track record on film, Hanks is a popular, widely admired and spectacularly versatile actor. But Falstaff? Fat Falstaff? Braggart, alcohol-saturated Falstaff? Shakespearean Falstaff? You could almost hear a loud “hmmm” coursing through people’s minds. Well, fear not. The Henry IV now running on the open air stage at the West Los Angeles Veteran’s Administration’s Japanese Garden is one of the most entertaining, engaging and enjoyable Shakespeares to come our way in some time. 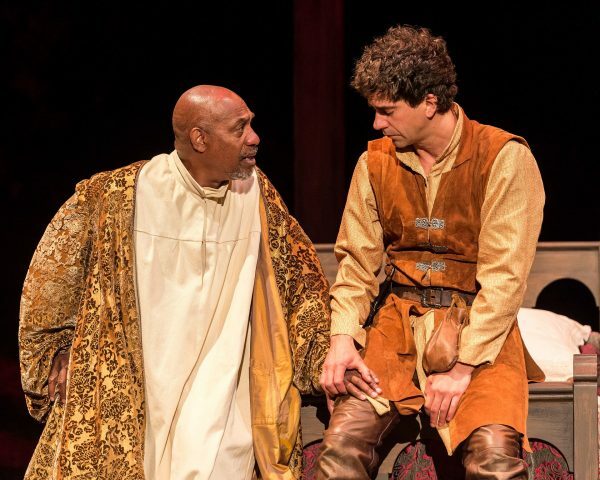 l-r: Joe Morton & Hamish Linklater in the SCLA Henry IV. Photo by Craig Schwartz. Hanks, a long-time supporter of SCLA, alongside its Artistic Director Ben Donenberg, has clearly given the production his full and meticulous attention. And I am not talking about his performance. We’ll get to that in a moment. I mean that he and Donenberg, along with Executive Producer Tom Ware and director Daniel Sullivan, have seen to it that the entire supporting company is on a par with Hanks and that this goes for audience comfort and all technical aspects of the staging as well. By far the best decision was putting Sullivan in charge because he also is responsible for this highly unconventional and, frankly, welcome adaptation. Being a theatre person first, he conflated the winding and confounding Parts I and II of Henry IV into a single play by cutting out the boring parts and keeping all the fun ones. Only purists should be bothered. All that stuff about 14thand 15thcentury English political intrigue and endless wars is mostly out the window (we have enough on our hands with 21st century politics). That makes room for all the comedy that takes place in London’s taverns, especially the Eastcheap, whose denizens prominently include the wily Falstaff and his much younger buddy Prince Hal (soon to be Henry V) among the other low-lifes. The sleight of hand is masterful and it includes some of Shakespeare’s best comic writing. l-r: Chris Rivera, Hamish Linklater & Tom Hanks in the SCLA Henry IV. Photo by Craig Schwartz. This results, of course, in the Tom Hanks show, and I say that without a trace of irony. Hanks is splendid as the carousing full-size Falstaff, all bombast, shrewdness, petty larceny, cowardice, laziness and hot air. The magic is that he manages not only to amuse us, but also to retain a remarkable amount of dignity even as he’s trashing it. Watch his expression — hurt and bewildered — in the play’s final moments, when the recently crowned prince, now a king, brutally rejects him. Hanks’ performance never betrays Falstaff as the fool he professes to be. At once hilarious and aware, he’s revealed by that startling final moment of conflicted humanity, as both more — and less — than he wants others to know. Raffi Barsoumian & Emily Swallow in The SCLA Henry IV. Photo by Craig Schwartz. In fairness though, everyone in the production honors it. Joe Morton is all regal anger and majesty as a booming Henry IV, while Harry Groener delivers a variety of finely etched smaller roles, most notable among them his twittery and lovable Justice Shallow. Last, but so important: technical aspects of the production are as smartly delivered as the performances — from the excellent sightlines to Ralph Funicello’s elegant unit set: a simplicity of open arches that allow use of the surrounding woods (supplied by nature) as part of the playing area. All is carefully lit by Trevor Norton. Holly Poe Durbin’s costumes hew to the 14th century, especially the one that gives Falstaff his girth and thighs as big as hams. Of special note: the sound design by Drew Dalzell. 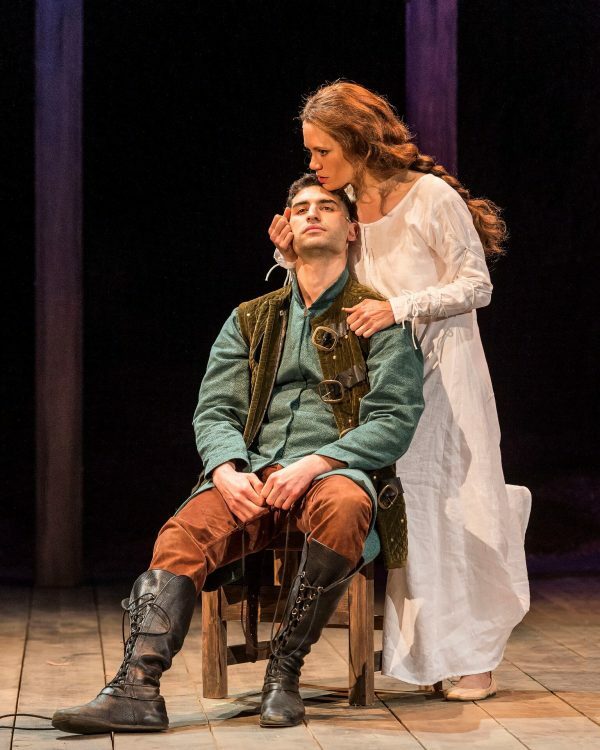 Except for one or two minor dead spots, all of this Shakespearean fun is distinctly audible — an all-too rare and most welcome occurrence on too few local stages. The set and cast of The Bristol Old Vic production of Eugene O’Neill’s Long Day’s Journey Into Night at The Wallis in Beverly Hills. l-r: Matthew Beard, Lesley Manville, Jeremy Irons & Rory Keenan. Photo by Lawrence K. Ho. As if by design (no, it wasn’t), The Bram Goldsmith Theater at the Wallis in Beverly Hills is just as briefly home to what is another very starry production, this one imported: The Bristol Old Vic’s Long Day’s Journey Into Night, one of Eugene O’Neill’s most personal and most demanding plays to both perform — or sit through. 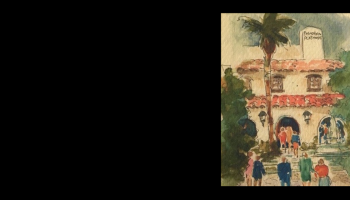 It certainly is O’Neill’s most expiatory play, a thinly disguised account of his life as the product of a profoundly troubled family. Despite its minor autobiographical adjustments, the writing is searingly transparent and true to the experience. So painfully honest that O’Neill left written instructions that it not be made public until 25 years after his death. His widow Carlotta had other ideas. It was published in 1956, just three years after he passed away, and won a posthumous 1957 Pulitzer Prize for O’Neill as well as a Tony when, after an initial London run, it played Broadway in 1956. 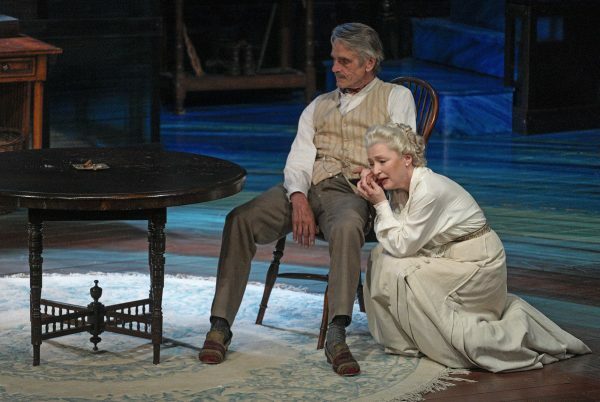 Jeremy Irons & Lesley Manville in Long Day’s Journey Into Night at The Wallis. Photo by Lawrence K. Ho. Like so much of this playwright’s work, Long Day’s Journey is overlong. But it contains some his most exalted and extraordinary writing. Given our shrinking attention spans and O’Neill’s injunctions against any cuts made to his texts, you need to be aware that, like the conflated Henry IV described above, this production clocks in at more than three hours, with one intermission. However. There is much to admire here and the fact that we are hearing about this Irish-American family from British actors interferes little if at all. Directed by Richard Eyre, the strong cast is headlined by Jeremy Irons, as a vigorous James Tyrone, and Lesley Manville (most recently seen locally in the film Phantom Thread) as his addicted wife, Mary Tyrone. Fiery and commanding supporting performances from Matthew Beard and Rory Keenan as sons Jamie and Edmund, respectively, complete the family portrait. These are rich portrayals, they are heartbreaking and they keep us on our toes, although the Bram Goldsmith is fundamentally too large a house for such an intimate play. 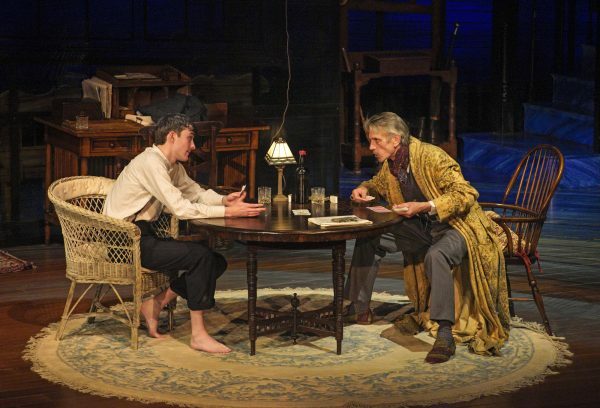 l-r: Matthew Beard & Jeremy Irons in Long Day’s Journey Into Night at The Wallis. Photo by Lawrence K. Ho. 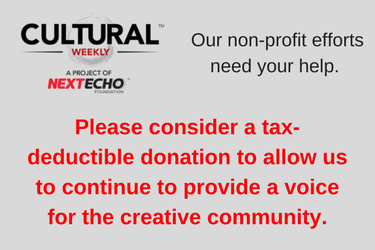 More troublesome (and not a new issue at this theatre), while the actors are mic’d, there is a level of sound distortion that demands attention. 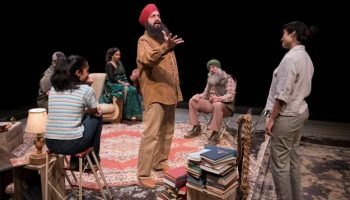 It’s not huge and it’s hard to tell if it’s an acoustical or sound design problem or both, but it is particularly noticeable in a play where every line insists on being heard. The sound design is attributed to Englishman John Leonard, so one is inclined to think that the issue is more local. There are some other intriguing choices made by the Brit designers, however. 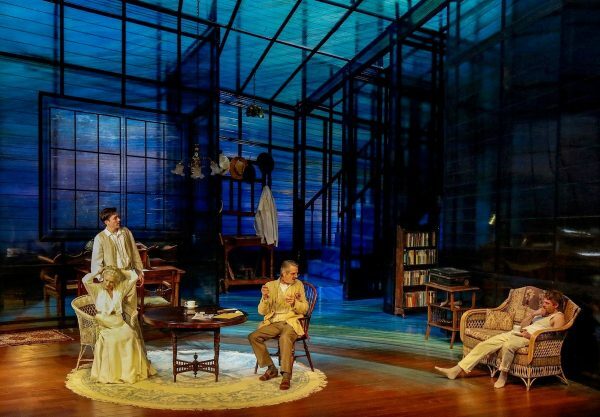 Rob Howell’s costumes are true to the play’s early 20th-century time frame, but in contrast, his unit set is a sleek, high-ceilinged modern affair with rather confusing translucent and reflective walls. It’s an odd contrast, not easily justified. Peter Mumford’s lighting has to deal with those walls and plunges the stage for long stretches into a lot of dimness in the play’s second half, when much is made of James Tyrone’s stinginess and insistence that not all the lights in the living room be turned on at once. I’m sure it’s a challenge to achieve and it makes its point, but at what cost…? 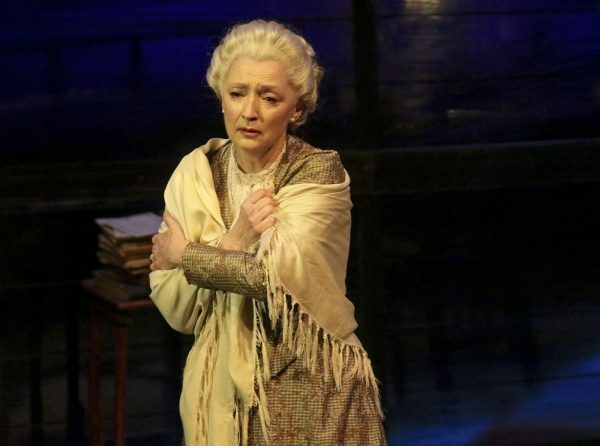 Lesley Manville as Mary Tyrone in Long Day’s Journey Into Night at The Wallis. Photo by Lawrence K. Ho. 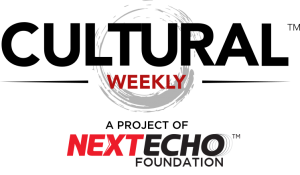 On the whole, though, it is rare enough to see two such high-caliber events in the same month. 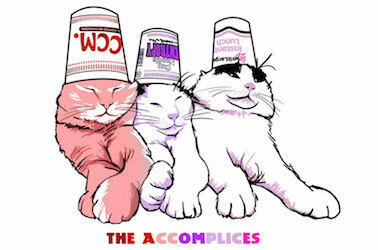 Better enjoy our good fortune and let the rest just serve. Top image: Hamish Linklater, Tom Hanks, Chris Myers and Rondi Reed in the Shakespepeare Center LA’s production of Henry IV. Photo by Craig Schwartz. WHERE: The Shakespeare Center of LA at The Japanese Garden on the West Los Angeles VA Campus, 229 Patton Avenue Los Angeles, CA 90049. WHEN: Tuesday-Sunday, 8pm. Gates Open 6:30pm for pre-show picnics. Ends July 1. RUNNING TIME: Two hours, 55 minutes. WHERE: The Wallis Annenberg Center for the Performing Arts, Bram Goldsmith Theater, 9390 Santa Monica Blvd., Beverly Hills, CA 90210. WHEN: Tuesdays-Fridays, 7:30pm; Saturdays, 2 & 7:30pm; Sundays, 2pm. Ends July 1. HOW: Tickets: $35-$105 available online at TheWallis.org/LongDays or at 310.746.4000 or in person at The Wallis box office. RUNNING TIME: Three hours & 30 minutes. 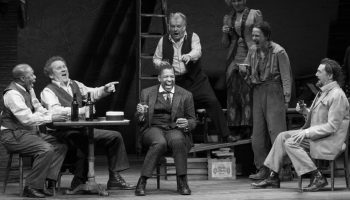 Two more informative and beautifully written reviews of Shakespeare and Eugene O’Neill in Los Angeles – written by the best theatre critic on the west coast (or any coast) Ms. Sylvie Drake. You really know your craft Sylvie and it’s a pleasure to read your work. You’ve got me all fired up to see both of those plays. Thank you, once again for reminding me how much I love the theatre. You’re the absolute best.